Although we are on the new release schedule now, Oath of the Gatewatch doesn’t feel like it came up on us that quick. 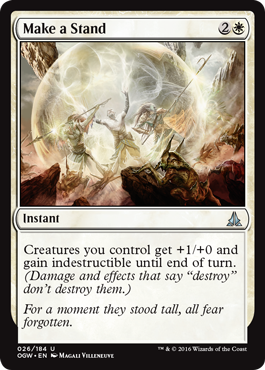 I guess one of the reasons for this is because of the impact that Battle for Zendikar made. Unless you’ve been living under a rock and not playing any MTG over the last few months, you’d know I meant almost none. There are a few cards such as Ulamog, the Ceaseless Hunger that revived a dying strategy (ramp), and Gideon fits into just about any white deck, but other than that BFZ was kind of a let down. I’m sure that many of the cards will eventually see play when rotation hits us in the spring, but until then they’ll be in OGW’s shadow. This set looks much better than what came before it, and it should definitely shake things up. However, we’re not here to talk about all the powerful rares and mythics, but rather how limited format will shape up. As it was last time, you’ll get 4 packs of the newest set (Oath), and 2 of the previous set (Battle). The pre-release skews in favor of OGW, but I think you should still have similar results when you draft or do sealed. If you’re interested in reading what I thought about white cards in BFZ limited, please follow this link to my previous article. Otherwise, lets get started. While not as good as Stasis Snare from the previous set, for one more mana you’re able to take out enchantments as well as creatures. It’s a worse Oblivion Ring for sure, but it’s a common so you’ll be seeing a lot of this card. 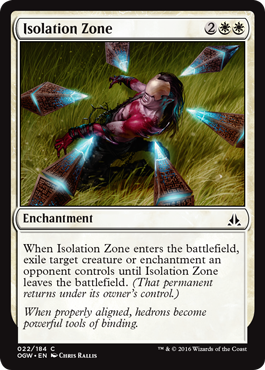 It will take care of an eldrazi, and even get rid of rival Stasis Snares and i-Zones. If you’re building Allies, BW lifegain, or UW flyers, you should probably grab 1-2 of these in draft. The format should be slow enough that the 3 mana cost doesn’t hamper it. 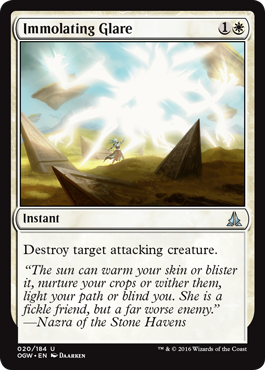 I personally didn’t care much about cards like Divine Verdict in the past because of its heavy cost, but Glare is as good as a 2 mana kill spell like Ultimate Price because limited is incredibly aggressive. This kills any attacking creature, no matter the power, color, etc., and it does it at instant speed. The only thing it doesn’t kill in BFZ/OGW limited are cards like Ulamog. I’d take it pretty early in draft. Probably not worth a splash, but great in Ally decks where you want to attack early and often and not have to worry about leaving back a blocker. I love playing token generators. Any effect that gives you 2 or more creatures from one card is worth playing. 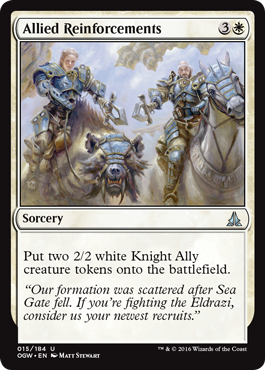 2/2 Knights are much better than 1/1 Kor tokens, but what makes this card even better is that the Knights have the ALLY subtype which will activate Rally effects twice. This combos really well with Allies such as Kor Entanglers (tap 2 creatures), Kalastria Healer (+2 life/-2 life to opponent), and Tajuru Warcaller (+4/+4 to all creatures). The more Rally-centric your deck is, the higher on your draft list this should. I’d take it early regardless, but if my first few cards had sweet rally abilities, I’d take this soon afterwards. 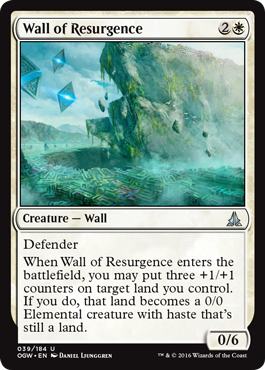 Hands down the best non-rare creature (value wise) in white in Oath is Wall of Resurgence. For 3 mana you get a huge blocker that stops 80% of the creatures in the format and get to create a 3/3 land creature. This kind of card is amazing with awaken spells like Sheer Drop and Rush of Ice, and I think that building a UW Awakening deck is a definite possibility in draft. I don’t know if I’d first pick this, but I’d probably make it my 2nd pick if it was passed to me. Get it early if you can. It won’t win you any games by itself, but it’s an amazing support card. Try blinking it for added value! If you’re playing an Ally deck, your mana curve is probably pretty light. After you hit 4 mana you’ll probably be fine, which means you’ll have a lot of extra mana floating around and it never hurts to have something to sink your mana into mid game. A 3/2 for 3 mana is decent in itself, but you can basically consider this a 3/2 flyer. It won’t stand up to vampires that well, but it will stop those small pesky Eldrazi in the air such as Mist Intruder and Skyspawner. He’s a roleplayer that will be in many white decks and he fits on your curve well. The new Support mechanic probably won’t be that great outside of limited, but in creature heavy sealed/draft decks with 14+ creatures, Relief Captain brings a lot of value. He give you a 3/2 body and pumps up 3 of your creatures, and if you have a card like Eldrazi Displacer his ability can get out of control rather quickly. 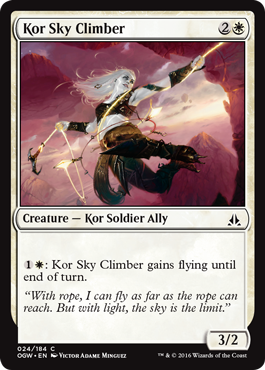 Great in Ally decks as the top of the curve, but playable in any white deck. So what do you do with all of these creatures with 1/1 counters on them? Give them flying of course! 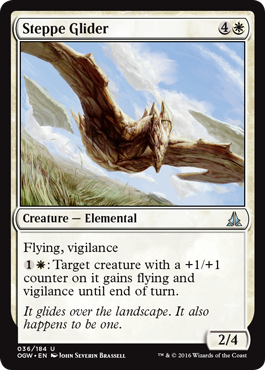 A well put together deck like UW Awakening or W/x Ally/Support would love a card like Steppe Glider. He’s one of the biggest non-rare flyers in the game and it also doesn’t tap to attack which is a bonus. The 5 mana might seem kind of high, but both his abilities and his skills are great in this type of format. He blocks and kills almost every flying creature your opponent can throw at you. I could also see you teaming it up with a Halimar Tidecaller to push its abilities to the limit. Making all of your lands (and creatures with counters) flyers makes it easy to overwhelm your opponent with creatures. Another solid roleplayer that should find its way into many a white deck at the pre-release. Expedition Raptor – The 5 Mana casting cost hampers this card the most, but getting a flyer and pumping up your creatures when it comes into play is worth looking into. Much better with multiple “Support” cards. Kor Scythemaster – Just like Kor Castigator before him in BFZ, Scythemaster is better due to his first striking ability. It also has the Ally typing which makes him great at the 3 mana position for that deck’s curve. Ondu War Cleric – Another 2/2 “bear” that fits well on curve, especially in an aggressive Ally deck. Life gain can be a deciding factor in some games, and the Cleric’s ability to gain 2 life could come in handy. I think most of the best white cards in this block are from BFZ. OGW has some decent cards, but there aren’t enough to build a deck around. If you’re going to build Allies you’re probably going to want to focus on getting cards from the BFZ packs you are passed. The support cards you get from OGW will give you a lot of value, but they won’t win you any games on their own. Ally decks should be much better this time around, but I think BW Lifegain and UW Awaken/Flyers will also be solid choices in limited. I look forward to doing the next color, blue, and hopefully I’ll have it done by Tuesday night (or before). Thanks for reading and if you have any comments or personal observations about Oath of the Gatewatch white cards and how they’ll fit into limited be sure to post them down below! Thanks for reading.